Porsche won the Le Mans 24-hour endurance sports-car race for the first time since 1998 with the first non-diesel win in a decade. Porsche’s 2.0-litre V4 turbo Petrol A123 battery powered 919 Hybrid car took first and second places, while Audi’s R18 4.0-liter V6 Turbo Diesel flywheel powered e-tron hybrid came in third. Both carmakers are owned by German-based Volkswagen AG, the world’s second-biggest auto manufacturer. The return of Porsche to Le Mans in 2014 after a 16-year hiatus and its subsequent victory Sunday underscore how Volkswagen is stoking in-house competition on and off the racetrack, even amid additional costs. 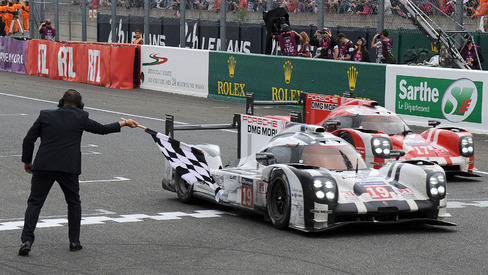 Porsche and Audi each entered three vehicles in the fastest vehicle category, Le Mans Prototype 1, or LMP1. VW is pouring money into new vehicles, technology and factories as the company plans to surpass global industry leader Toyota Motor Corp. by 2018. Maintaining a technological edge is vital for VW’s upscale brands, which also include Bentley and Lamborghini, as they vie for affluent customers with the likes of BMW AG and Daimler AG’s Mercedes-Benz. Audi and Porsche accounted for 66 percent of Volkswagen’s operating profit in the first quarter. Volkswagen, which has one of the largest research and development budgets of any publicly traded company, is investing 85.6 billion euros ($96.1 billion) through 2019 to add models and production capacity. Rising costs to develop electric cars and new digital features such as piloted driving are weighing on Volkswagen’s efforts to improve profitability, including a program announced a year ago to increase earnings at its namesake passenger-car brand by 5 billion euros by 2017. The manufacturer has taken steps to rein in costs companywide by sharing more parts among a wider range of vehicles. Porsche and Audi have denied reports in recent weeks that they plan to enter Formula One car racing, citing high costs and shrinking visitor numbers. Formula One “needs to solve its problems alone,” Rupert Stadler, Audi’s CEO, said last month. Audi and Porsche say Le Mans provides a better opportunity to test new technology that can be used later in road cars, such as lightweight construction and high-performance hybrid electric systems. Ford Motor Co., the second-biggest U.S. carmaker, said Friday it will return to Le Mans in 2016. Competing in the GT racing class, the Dearborn, Michigan-based company will commemorate the 50th anniversary of its 1966 sweep of the top three places at the race.